On the last episode of NCIS we learned a few little things about our team with the most interesting one being that Gibbs has a secret spot on the roof of their work building where he sneaks away to relax. Believe it or not, Gibbs does unwind here and there – he’s not a machine people! Unfortunately, now Torres, Bishop and McGee have all discovered it after a body was discovered up there. We also saw some progress on Ducky’s book as the team all received copies and gave their notes to him and Casey so he can move forward into his next draft. We didn’t see Casey in this episode, but the fact that she was mentioned continues to fuel our fire behind the idea that she’s going to be taking over Abby’s lab when she leaves at the end of the season. Tonight, the show veered in a different direction early on when it was revealed that there was a killer out there looking to take down a very specific set of targets … and that one of these targets happened to be a little girl named Elena, someone completely innocent and not deserving of any sort of scrutiny. 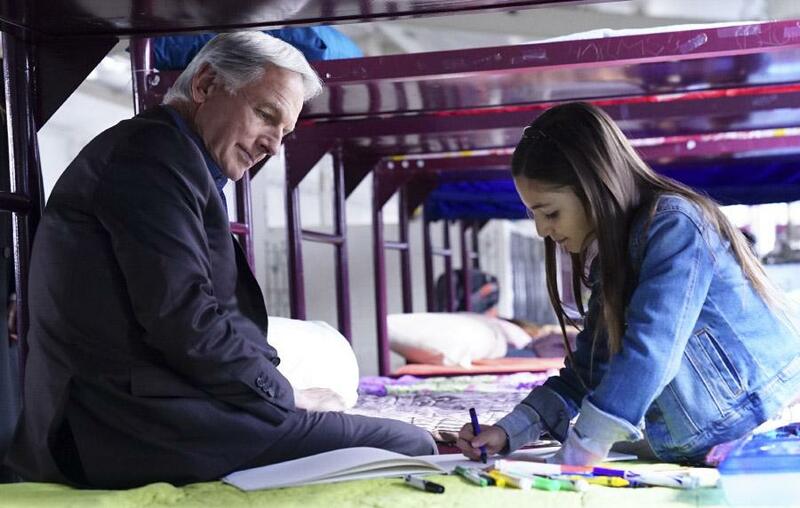 She was in danger, and with that the NCIS team had to figure out a way to take care of her. Ultimately, this meant Gibbs deciding to take her in for temporary custody. She claimed to not speak English, but the longer that Gibbs spent with her, the more that he realized that she actually holds quite a few secrets. Not only can she speak English, but she is actually very smart and intuitive. Unfortunately, she still did not know who was after her or why, but that was the job of the entire team to figure out. Due to some smart interviewing by Sloane and Gibbs (in part due to their attempts at friendship), they figured out that Elena’s family may have been connected to weapons smuggling and a complicated operation that happened prior to her arrival in the country. Her mother decided in the end to save Elena in the midst of the chaos; yet, she lost her own life. Elena blamed herself for it, and figured out soon after this that this in part may by why she was being targeted. Trying to find the actual target in Javier Martinez was a little bit more difficult than Gibbs and the rest of the team really expected; nonetheless, they did that, and at a service no less. They found someone willing to testify and that was enough to bring Javier in. The complications come in how their witness has a questionable immigration status and trying to help him could prove challenging. The good news for Elena is this: In the end, the NCIS team was able to reunite her someone who loves her, but it also just so happened to be their witness. There was no guarantee that he would even be around to be a father for her in the future — hence Gibbs’ final, haunting line that as happy as this reunion was, nothing is altogether okay. NCIS season 15 episode 19 did take a little bit of time in order to get going. The case was a little bit abstract — there have been so many different cases of weapons smuggling over the years that they all start to blend together. Yet, what made this episode stand out was the presence of Elena, who was a delight with her love of hamburgers and quick bond with Gibbs and Sloane. This entire episode allowed us to see a different side of Mark Harmon tonight and that was appreciated — even when it was somewhat heartbreaking to hear him reminisce about his past as a father. What did you think overall about NCIS season 15 episode 19? Sound off now in the comments!